1x5mm Crypto Cut / DIN Security Level P-6 for information requiring extraordinary security. More Info. The stylish new IQ Office Pro P6+ shredder by Leitz is the ultimate in design, performance and security, an ideal shredder for small office use. It can shred up to 5 sheets of A4 paper at one time and has a 240 minute continuous run time. It is also fitted with an LED to signal when the shredder needs to cool down. The IQ Office Pro P6+ features high performance security - paper is shred into ultra secure DIN P-6 1x5mm Micro Cut pieces (over 12000 pieces) making this shredder 2 times more secure than standard Micro Cut. 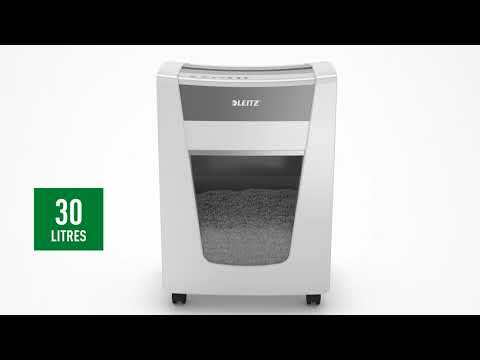 The extra large 30L bin will hold up to 390 A4 sheets; the bin full indicator on the shredder will tell you when to empty it, using the pull out bin. The IQ Office Pro P6+ features simple and intuitive touch controls and anti-jam technology that automatically stops and reverses the paper when too much paper is inserted. The IQ Office Pro P6+ can also shred paper with staples and paper clips attached. The IQ Office Pro P6+ comes fitted with four high quality wheels making it easy to move around the office and the extra quiet operation mean this shredder causes minimal disruption. The use of a P-6 shredder such as the IQ Office Pro P6+ will aid your GDPR compliance.